KAMPALA – The Public Procurement and Disposal of Public Assets Authority (PPDA) has issued a damning dossier on the procurement works for Busega –Mpigi Expressway. PPDA is responsible for regulation and supervision of procurement and disposal of government-owned property and other assets. 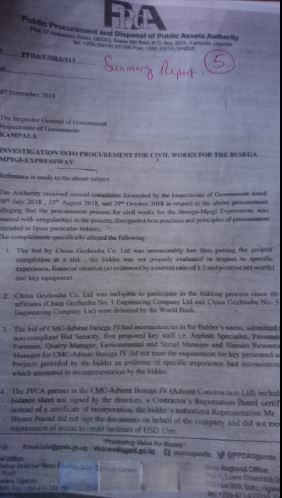 According to the report dated November 8th, 2018 and addressed to the Inspector General of Government (IGG), UNRA and African Development Bank (ADB-the financiers of the project), the procurement body accuses UNRA of trying to award the Shs555bn expressway contract to a fraudulent company. The company (best-evaluated bidder) which had been forwarded to the African Development Bank for approval is Ms CMS in a joint venture with a small Tanzanian firm, Advent Ltd. Advent Ltd has no background in Road construction but mainly specialises in buildings. According to the PPDA report signed by acting executive director Benson Turamye, there are several inconstancies in the procurement process with disregard for best practices and principles of procurement, all intended to favour particular bidders. The road construction project covers a total of 63kms between Busega on the outskirts of Kampala and Mpigi along the Kampala – Masaka highway. The procurement process has been on for more than 2yrs, with the procedure heavily delayed by whistle-blowing and corruption allegations. The contract was first awarded to a Chinese firm China Civil Engineering Construction Corporation and China Railway 19th Bureau Group Co Ltd (CCECC &; CRGC) last year. However, the when the above company was submitted to the bank, the bank raised a few queries which it wanted UNRA to answer. Instead of answering the queries, UNRA nullified the bid and went into another evaluation. In the second evaluation, another Chinese firm Ghazouba Group Co. Ltd emerged as the best-evaluated bidder. However, the company dropped out on realising it had underquoted the works and that there was a likelihood of failing to complete the project. Since CMS-ADVENT joint venture was tactically placed in the second position on the list submitted by UNRA to the bank, it would automatically take the deal. It is against this background that UNRA submitted CMS-Advert JV as the best evaluated despite protests from PPDA over material deviation and several inconstancies in the submitted bid document. 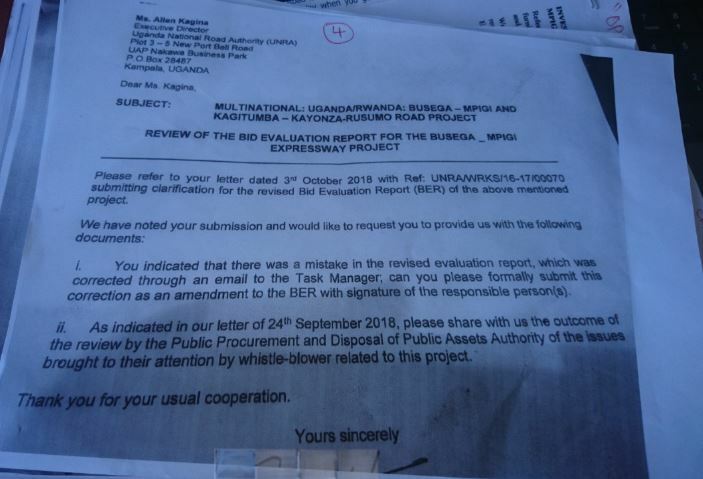 PPDA had earlier raised a red flag on the procurement process but it was downplayed the UNRA Executive Director Allen Kagina in a letter dated September 7th 2018. “The civil works for the Busega-Mpigi Expressway are financed through a loan from the African Development Bank (ADB). ‘The procurement has been characterized by an unusual number of whistle-blowers and complaints. I brought this to the attention of the honourable minister of works and Transport through a letter dated 4th July 2018, which was copied to you. Bids for this procurement were received in August 2017 but the process has not been finalized. The main reason for the delay in concluding this procurement has been the need to investigate and address issues raised by the whistle-blowers. 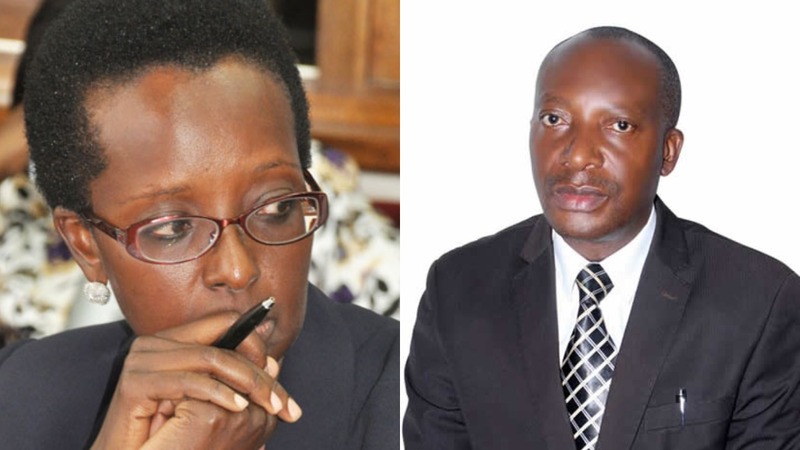 However, the bank objected to Ms Allen Kagina’s request for a no objection and instructed the PPDA and IGG to review the entire procurement process and asked UNRA to avail it with the outcome of the review. 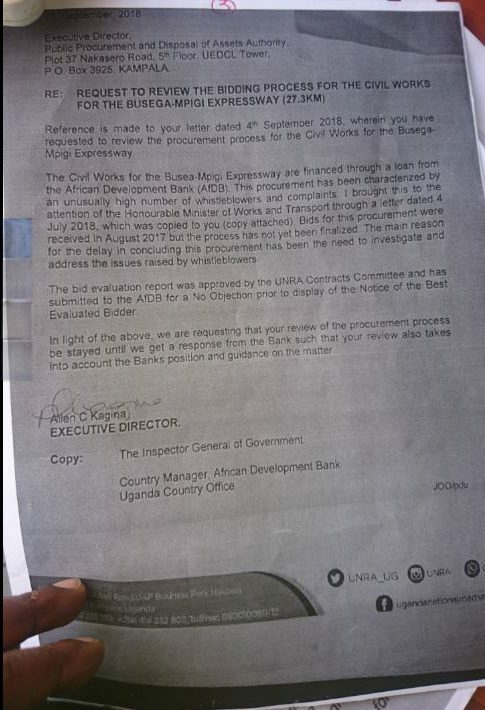 “As indicated in our earlier letter dated September 24th, please share with us the outcome of the review by the Public Procurement and Disposal of Public Assets Authority of the issues brought to their attention by the whistle-blower related to this project,” an official of the bank wrote to Ms Kagina in an email titled Review of the bid evaluation report for the Busega-Mpigi Expressway Project.